Home North Bengal political news Who Will Emerge Victorious in the Darjeeling Lok Sabha Seat? Who Will Emerge Victorious in the Darjeeling Lok Sabha Seat? After big names like Subramaniam Swamy and Hardeep Singh Puri did the rounds, the BJP finally picked Raju Sing Bista as the party’s candidate from the Darjeeling Lok Sabha seat. The question in everyone’s mind now is, “Who is Raju Singh Bista?” Most people never heard of him before his name came out of nowhere as the BJP’s candidate for the constituency. Local news outlets have described him as an entrepreneur who used to be the director of an NGO. Bista is a non-entity in the political arena of Darjeeling, where the demand for a separate state of Gorkhaland dominates. According to media reports, born in Manipur, Bista is a member of the RSS. A photograph shared by the spokesperson of the Gorkha National Liberation Front (GNLF) with Raju Bista (at his Delhi residence) has M.S. Golwarkar, an RSS ideologue in the frame. The photo was widely shared on Facebook and other social media platforms. Unlike Bista, former non-Gorkha BJP MPs of Darjeeling, Jaswant Singh and S.S. Ahluwalia, were not associated with the RSS right from the beginning of their political career. Bista is both politically and ideologically right-wing. If he wins the seat with his Gorkha image, it could possibly change the political dynamic of the hills. Polarisation, which is what the RSS is known to promote, could then take the front seat in the region. BJP supporters in Darjeeling are now in a dilemma: how to relate to Bista. They are asking many questions on social media: does Bista know Darjeeling well enough? Can an unknown outsider be trusted? Has he been associated with the Gorkhaland movement in the past? The general public, on the other hand, has different questions. Why did the BJP choose Bista for Darjeeling? Why did the party not choose known faces like Swamy or Puri? Why did the combined force of the GNLF and the Bimal Gurung faction of the Gorkha JanMukti Morcha (GJM) declare allegiance to the BJP without any conditions? Is it because the GNLF and the Bimal Gurung faction are desperate to come back to power? Or is it because the BJP has a low chance of retaining Darjeeling? Did Bista’s deep pockets influence the decision? By introducing an unknown face like Bista, the BJP has already surrendered the battle. It is also speculated that Mamata Banerjee and Narendra Modi have a tacit understanding for the Darjeeling seat and hence the BJP has fielded a weak candidate. It must be recalled that both worked together to dismantle the 2017 Gorkhaland movement. The former used her state forces and the latter sent 15 companies of Central Armed Police Forces to Darjeeling. Under the direction of the respective governments, both forces killed many innocent Gorkhas. Amid the rising election fever, videos and pictures are being circulated, reminding netizens of the state’s role in 2017. In that process, an argument is being made to favour the party ruling at the Centre. Such political messaging is a deliberate attempt to politicise sentiments of the electorate, to evoke fear of the state’s past atrocities. As the mythologist, Devdutt Pattanaik says, “When we see chaos, we seek control”. It is crystal clear today that the chaos created by some opportunists was meant to seek control. To make inroads in a state where they did not have a single MP in 2004 and just two in 2014. The BJP is now aiming to win up to 22 in the upcoming general election. The TMC has nominated Amar Singh Rai for the seat. The CPI(M) has fielded Saman Pathak, the Congress has chosen Sankar Malakar as its candidate while the Jan Andolan Party’s (JAP) candidate is Dr Harka Bahadur Chettri. The candidate of the Communist Party Revolutionary and Marxist (CPRM), R.B. Rai, has withdrawn his nomination and hasn’t yet declared his support to any candidate. The Darjeeling Lok Sabha constituency has seven assembly segments. The table below illustrates the voting patterns of the 2016 assembly polls and the 2014 Lok Sabha polls. In 2014, the GJM-BJP got 42.73% of the total votes polled, whereas the TMC bagged 25.47%. The BJP has a negative margin of -12.47%. 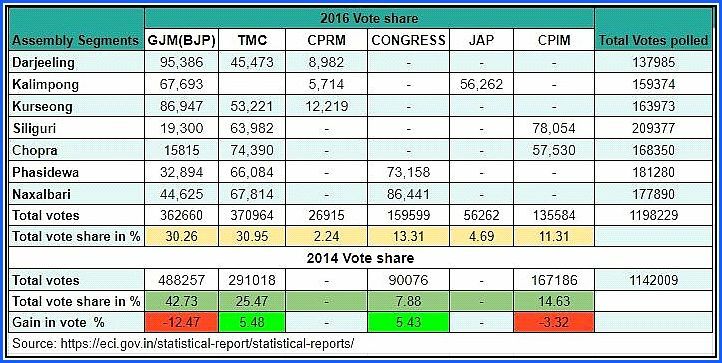 The TMC made a significant gain of 5.48% in the 2016 assembly polls and had a slight edge in the total vote percentage over the GJM-BJP. The Trinamol Congress also won the Mirik municipal election in 2017. This time around, the TMC’s vote share is also likely to increase in the Hills as the Binay faction of the GJM is supporting it. Most of the state funded community developmental boards are also probably supporting Amar Singh Rai. Thus, the vote in the hills will splinter and the BJP candidate’s chances of winning the seat are much slimmer. The party’s support base in the plains is insignificant. Though the GNLF is supporting the BJP this time, its strength has been substantially decimated following the GJM’s ascension to power in 2007. The GNLF managed an average of 8.33% of total votes polled in three hill assembly segments in the 2011 assembly polls. Since then, they haven’t participated in any elections, but supported the TMC in the 2014 Lok Sabha polls, 2016 assembly polls, 2017 municipal polls and the JAP in the 2016 assembly polls.They can make a difference of 18-24% of the vote in the hills, which is close to 8-10% of the total votes in the seven segments. The silence of bigger alliances like the BJP-GNLF-Bimal and the TMC-Binay factions in Gorkhaland has added a twist to the 2019 Darjeeling election. Forgetting the key issues, these parties are fighting in order to stop the other from coming to power. Biswadeep Tamang is a student at Jadavpur University.